Note: This week our humble website, www.bilnkit.com, blew past the 100,000 hits milestone with a readership of over 200 folks!?!? Hard to believe that what started life seven years ago as a Word document attached to an e-mail could mature in such a way! Kit and I are as confused at why these journals remain popular as I’m sure some of you are. Thanks to everyone for your continued encouragement, support, and comments as we document our experiences while meandering about this great country…..we value each and every one of you! 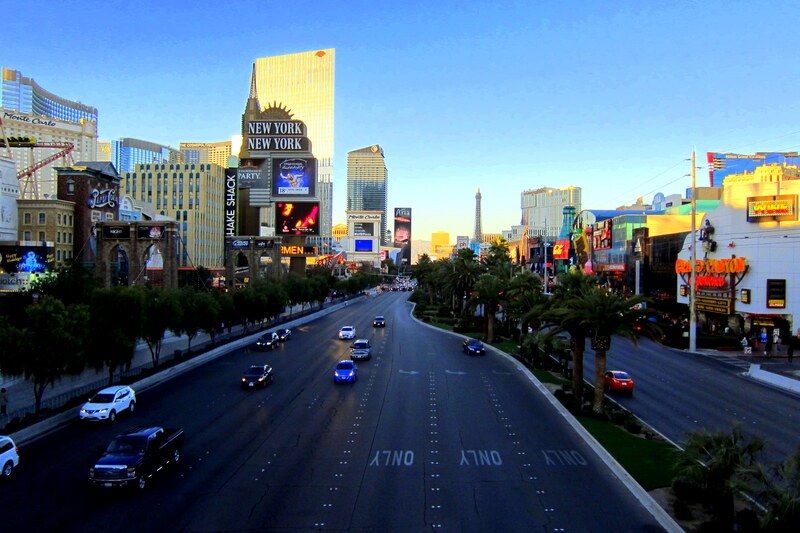 Tuesday, December 22, 2015 through Sunday, January 3, 2016-Las Vegas, Nevada: Kit and I enjoyed a great two weeks in town with our Las Vegas family. 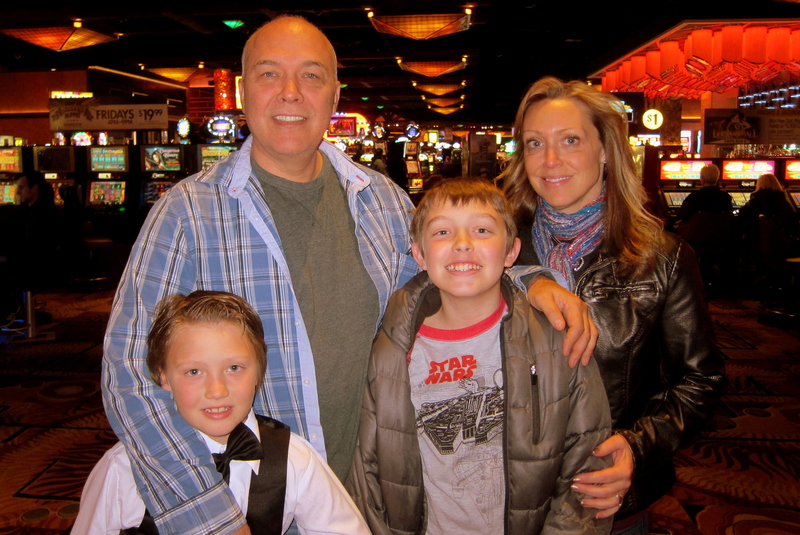 Suzie and Kevin, with Jack, age 11, and Tucker age 8, have lived in the city of lights for years, and thoroughly enjoy the excitement and opportunities of the area. 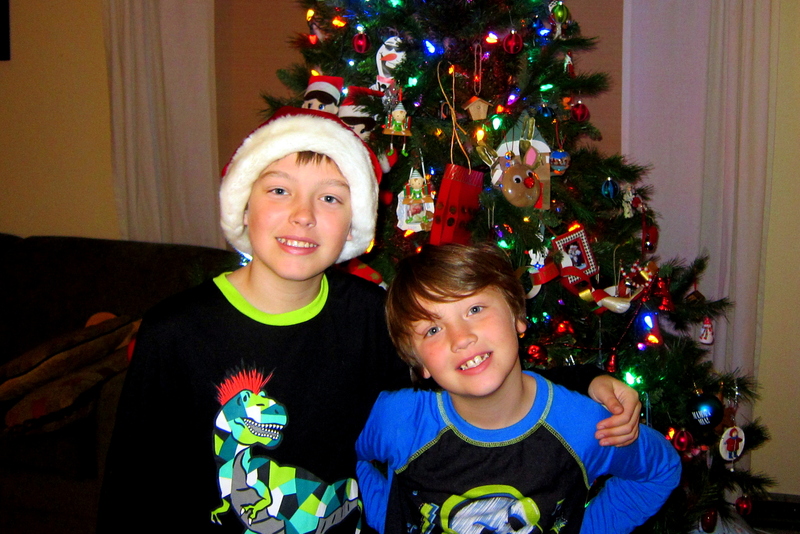 Both grandsons are smart, inquisitive and active…..they are a joy to be around. 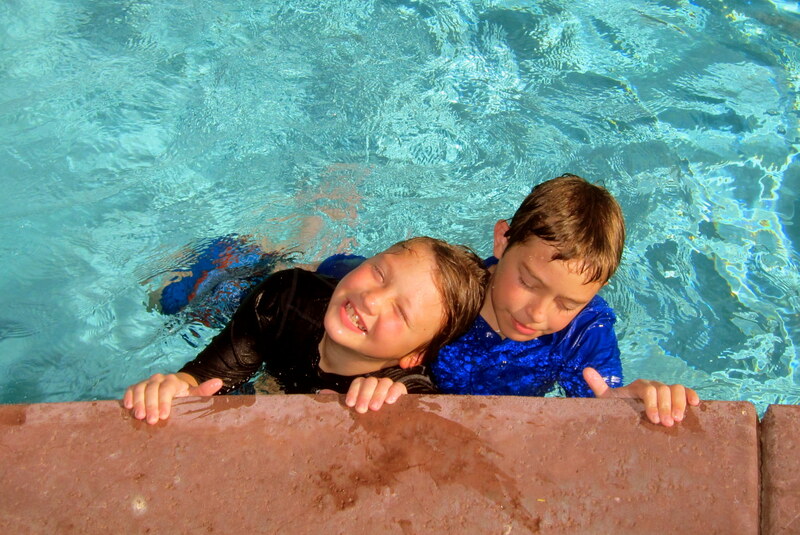 In fact, had we know that grandchildren would be so much fun…..we would have had them first! 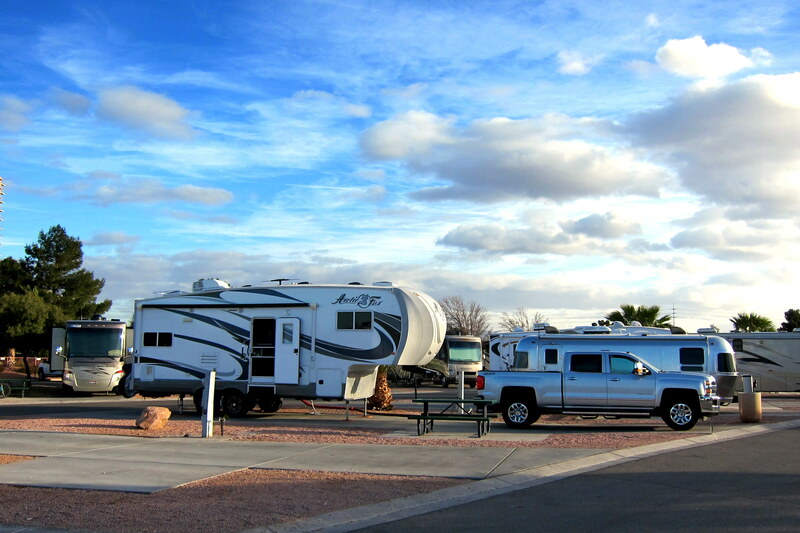 As in the past couple of years, we have set up camp at Oasis RV Resort, a short distance from the kid’s home in South Las Vegas. 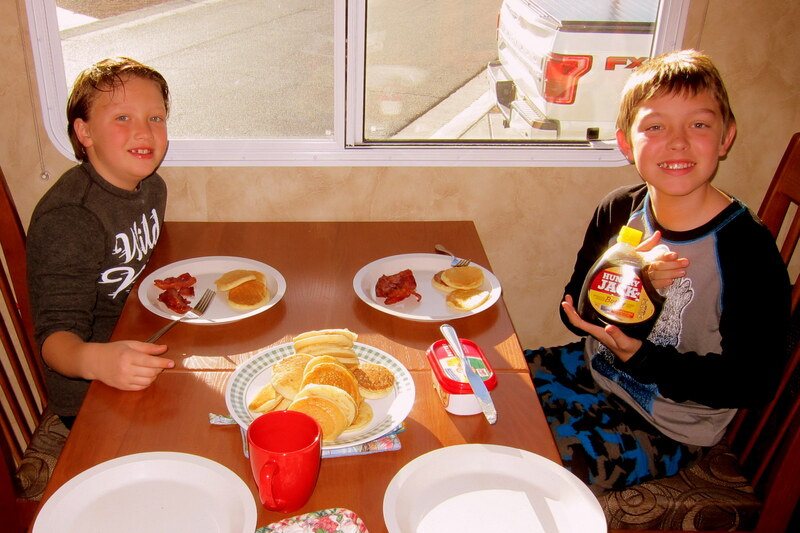 This humongous 805 site RV Park features everything one could want in a destination campground, including a large luxury hotel style reception center and lobby that contains a store, café, ballroom and lounge area. 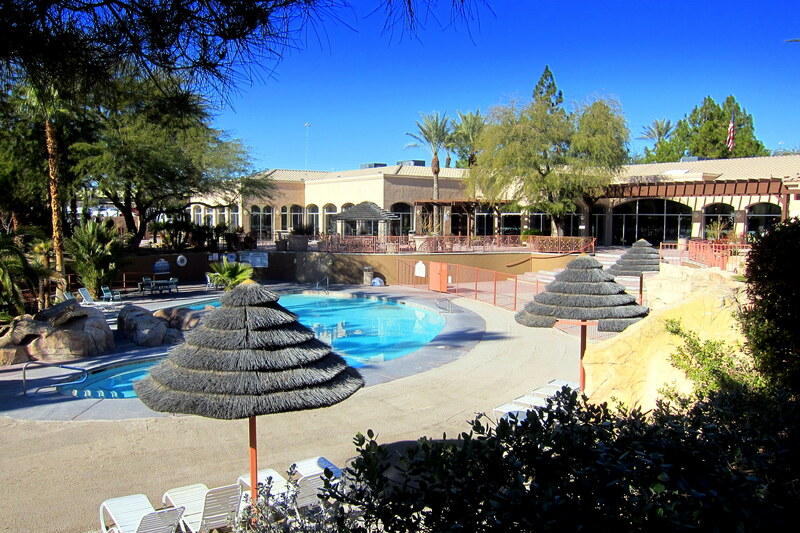 Just outside this centralized complex is a beautifully landscaped area with a kid’s pool complete with a beach sand area, multiple waterfalls, an adult pool and spa. The weather was a bit cooler than normal for this time of the year, but that didn’t prevent the boys from spending many hours in the large heated pool. 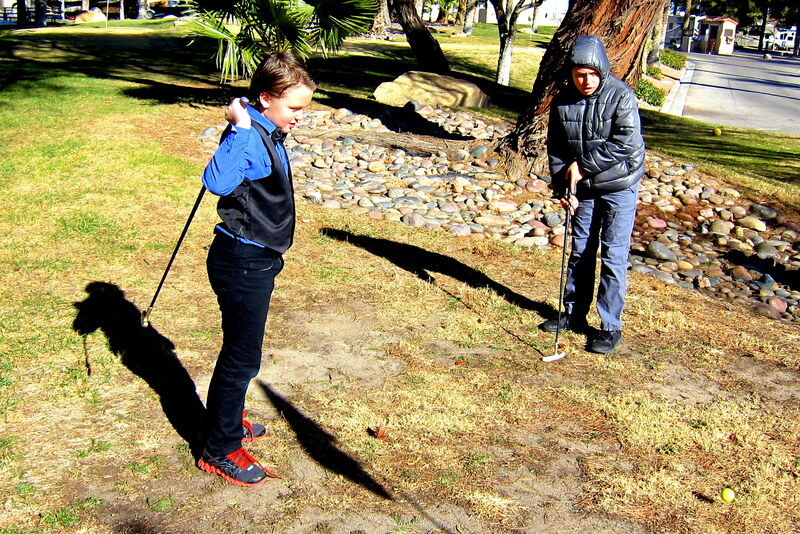 Surrounding the complex is an 18-hole putting course that Jack, Tucker and I tried our hand at. We made up our own rules, sometimes on the fly, and “tried” to keep the golf balls from straying into the RV Park itself. As mentioned, the weather was sunny but cool, in fact on Christmas day it was colder in Las Vegas than at our home in Maine!?!? Speaking of Christmas, we had a great time taking the boys shopping so they could buy gifts for their parents as well as for each other. In addition, an annual tradition is for Kit and I to give them a set amount and turn them loose for a personal shopping spree. It is fun watching as they fill their shopping baskets and try to squeeze the most out of their available funds. We then brought their chosen Christmas gifts back to the camper, wrapped them up, and brought them over on Christmas morning. 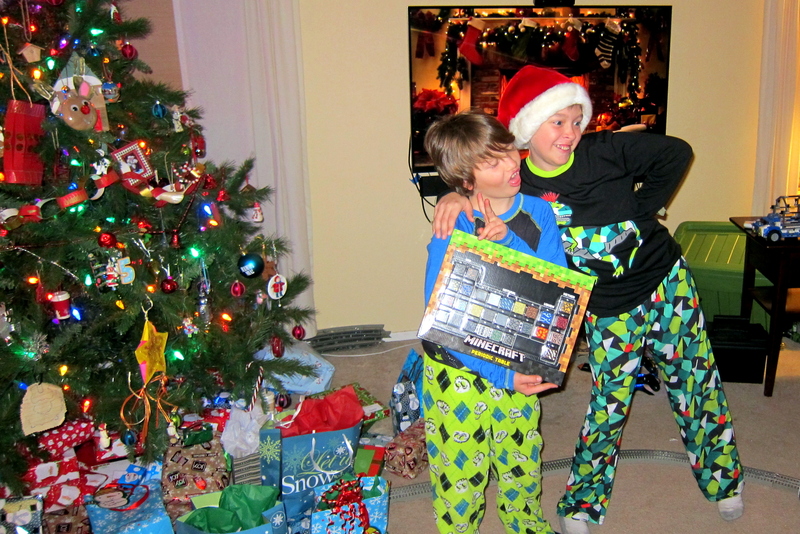 Not sure what they like better…..the anticipation of waiting for a present they personally selected or the anticipation of waiting to see what Santa may have brought them. 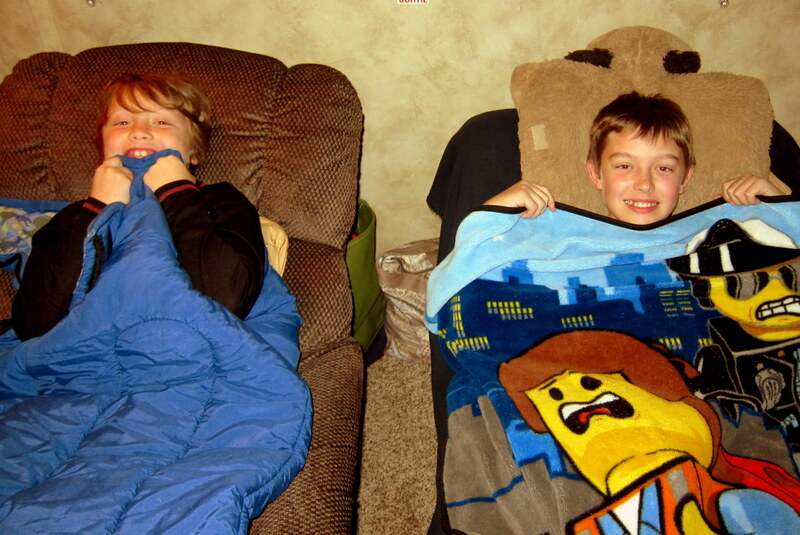 On a number of evenings, we enjoyed having Jack and Tucker sleepover in the camper with us where they preferred to make their beds on the La-Z-Boy recliners. Every morning, the boys were the first to awaken and they made a beeline for our bed to snuggle under the quilt and talk about the plans for the day. The first order of business was, of course, breakfast! Kit did a wonderful job grilling a huge pile of pancakes and a bunch of bacon……hungry Jack loved the Hungry Jack syrup, by the way. 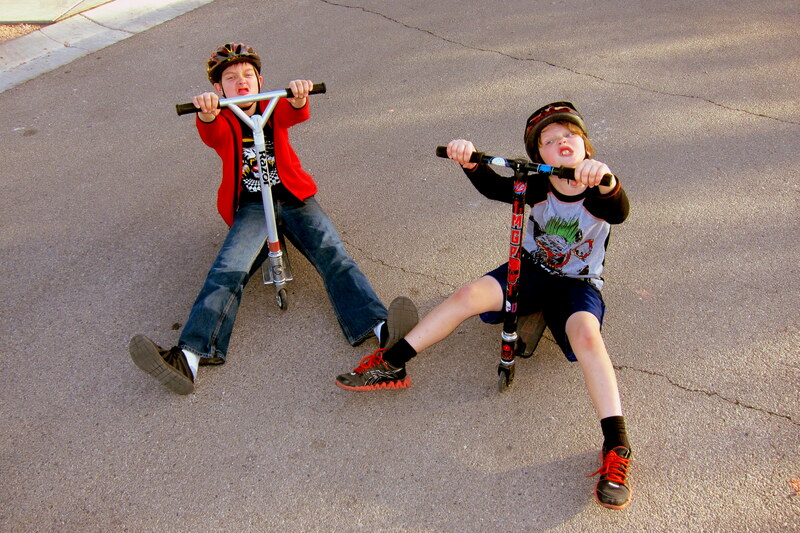 The rest of the day was spent at the clubhouse, or in the pool, or riding their bikes and scooters around the park. 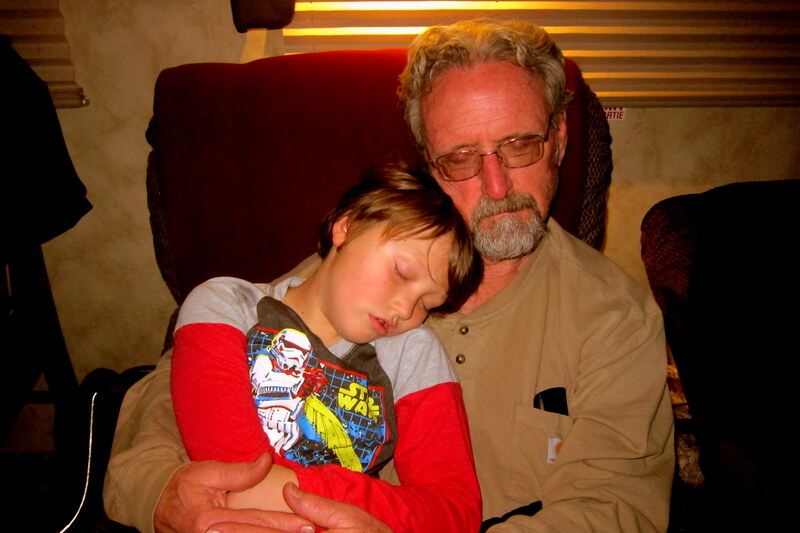 All the outdoor activity, usually wore them out…..here I’m feigning sleep so young Tucker doesn’t wake up. Kevin was off work the second week we were in town, so they boys rightfully wanted to spend some time with their father. This provided Kit and I the opportunity to mosey around town and shop for necessities and camper supplies…..or to just relax on the pool deck with a good book. 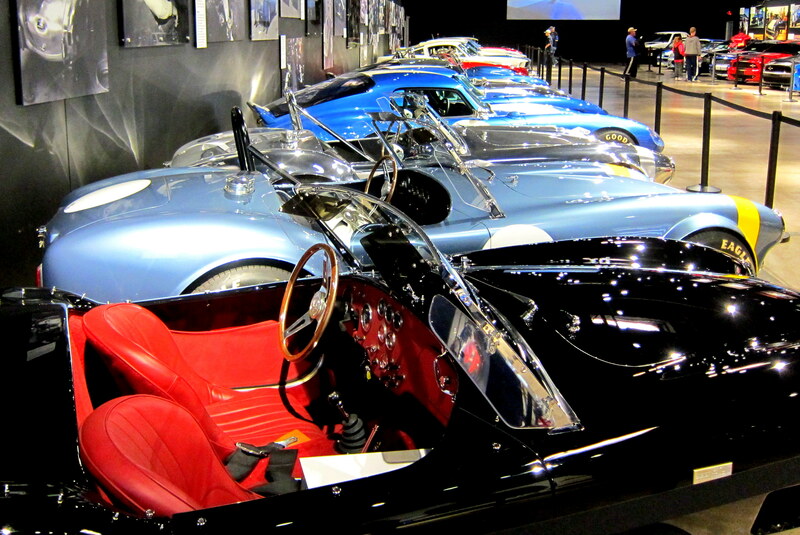 One Vegas attraction I wanted to revisit was the Shelby Heritage Center at their new location south of the strip. 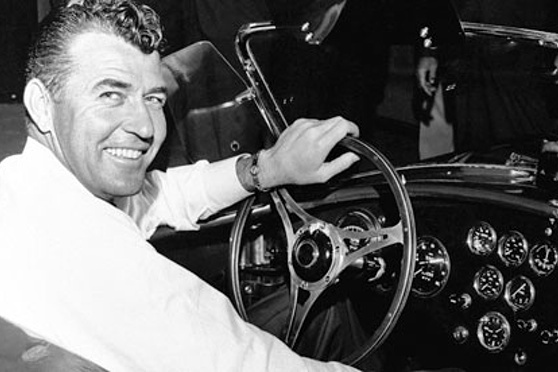 Carroll Shelby is an American automobile icon. He started his automotive career after serving as a pilot in the US Army Air Corp during World War II. After mustering out, Carroll began racing various high performance sports cars and racked up a series of wins leading to the Sports Illustrated Driver of the Year in 1955…..however his crowning achievement was winning the 24 hour at Le Mans in 1959. 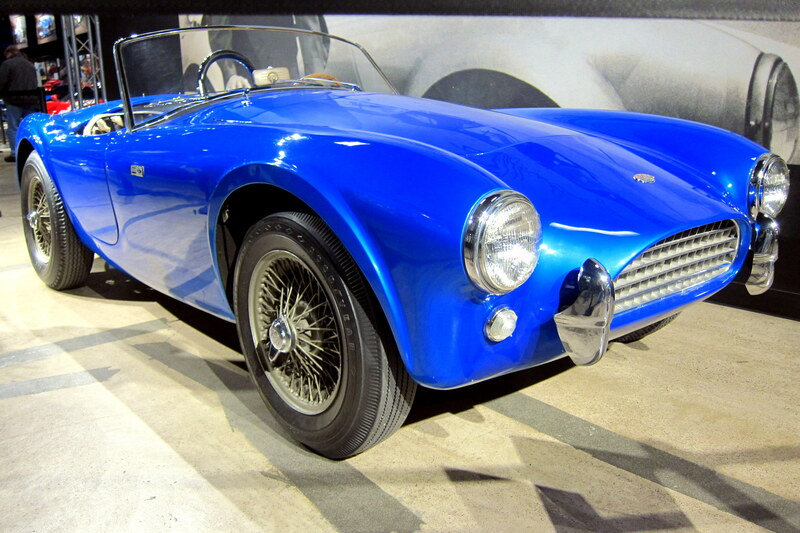 In the early 1960’s Carroll developed his own sports car using a rolling chassis from the British automaker AC Ace and marrying it with a racing engine from Ford Motor Company. The above photo is AC Cobra #1, the most valuable car that Carroll Shelby ever built, currently estimated at 26 Million dollars! And that’s in “survivor” condition…..in other words, not restored! Notice the tattered upholstery in the photo above, Carrol maintained ownership of this car throughout his life and expressly stated that it never be restored but left as is…..a testimony of the roots of his company. This one-off racing sports car drew a lot of attention from the motoring press of the day. Whenever Carrol shipped the car out for a magazine review and road test he painted it a different color, thereby giving the illusion that he had a stable of these magnificent cars. Note the gentleman in the photo above…..his name is Jim King and he was our guide for the very informative and highly entertaining tour of the Shelby Heritage Center. 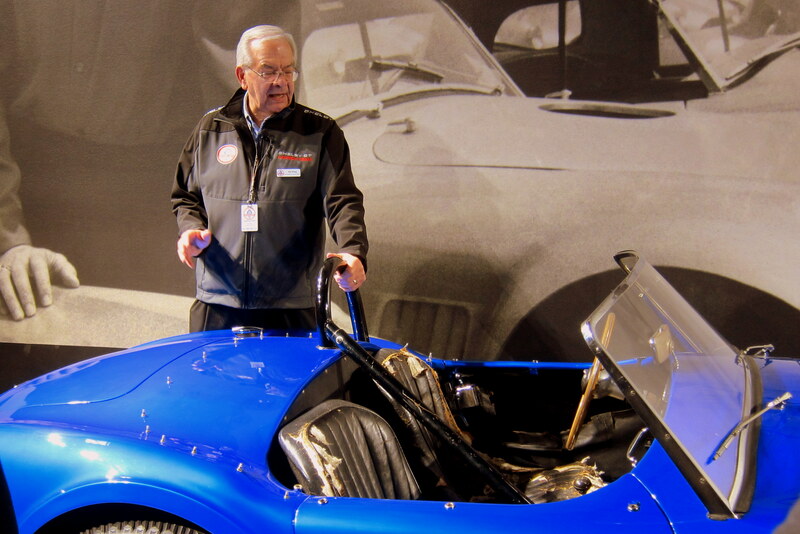 Jim, a retired engineer form Ford Motor Company and a lifelong Ford Racing enthusiast, wove Shelby historical information with his own experience with Ford and Shelby American Motor Company. Jim gave a brief synapsis of the linage of the company through the historical automobiles that were on display. After viewing the museum cars, Jim led us onto the factory floor where we were able to observe the manufacturing of the newest sports cars. 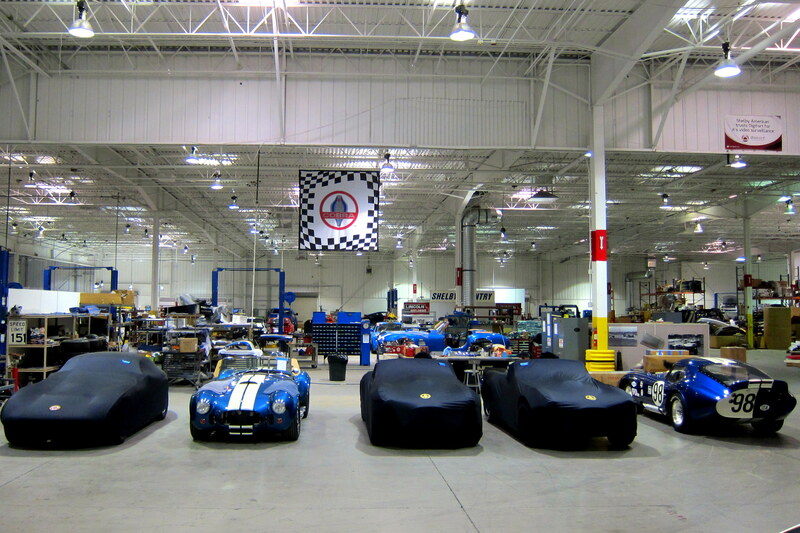 Yep, the AC Cobra is still being manufactured, one at a time in this relatively small automotive plant in Las Vegas! The cars shown under black are customer’s automobiles being readied for shipment and delivery. They are kept under cover for protection and to ensure the new customer’s first glimpse of their six figure car isn’t on Facebook! 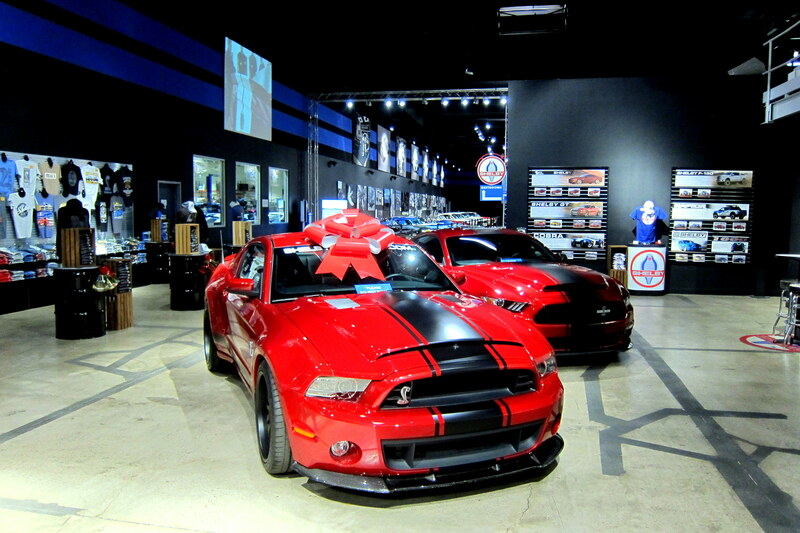 Shelby American also creates highly modified Ford Mustang’s…..some boasting horsepower ratings of 1000 HP!! A barely street legal racing machine!! Some of these 2016 Mustangs, modified by Shelby American, have an MSRP of $250,000.00 each…..yep, a quarter million dollars!?!? 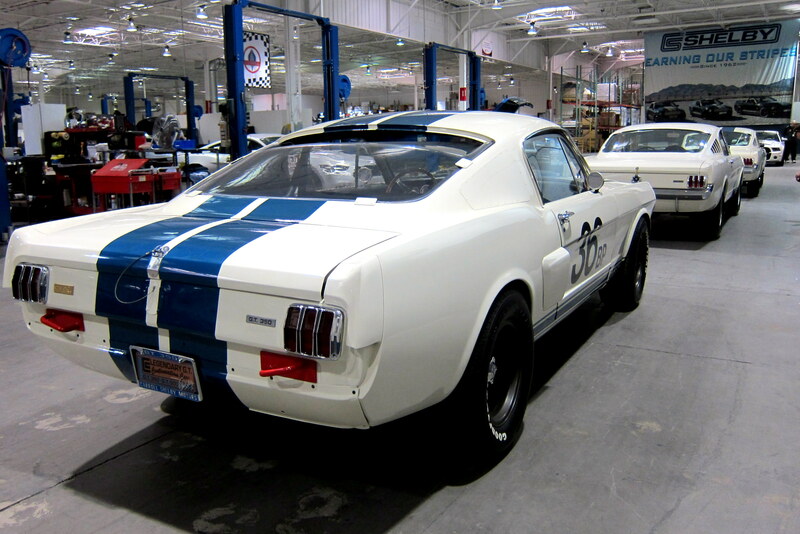 In addition, the factory will restore any previously built Shelby automobile for the old car enthusiast…..such as the line of famous 1965 Mustang GT350’s shown below…..the one closest to the camera is a GT-350R, the rarest of the rare! 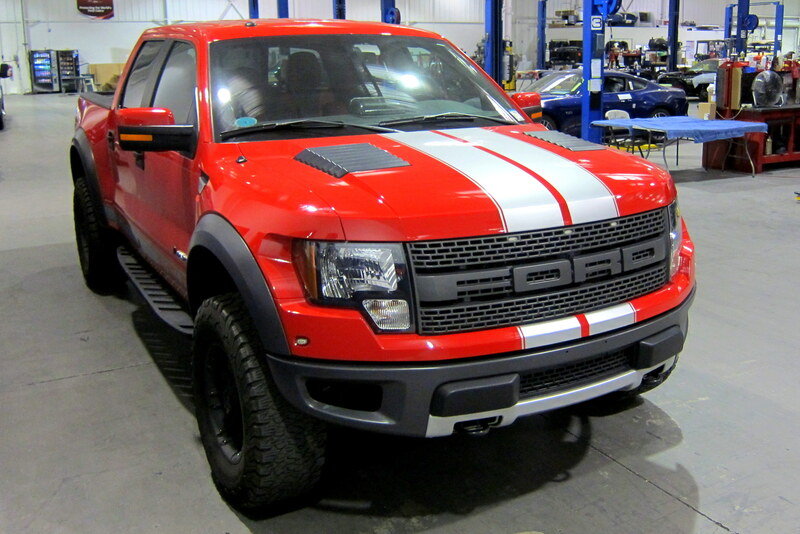 Shelby American also modifies Ford F-150 Pickup trucks, tweaking the engine to an unbelievable 700 horsepower! 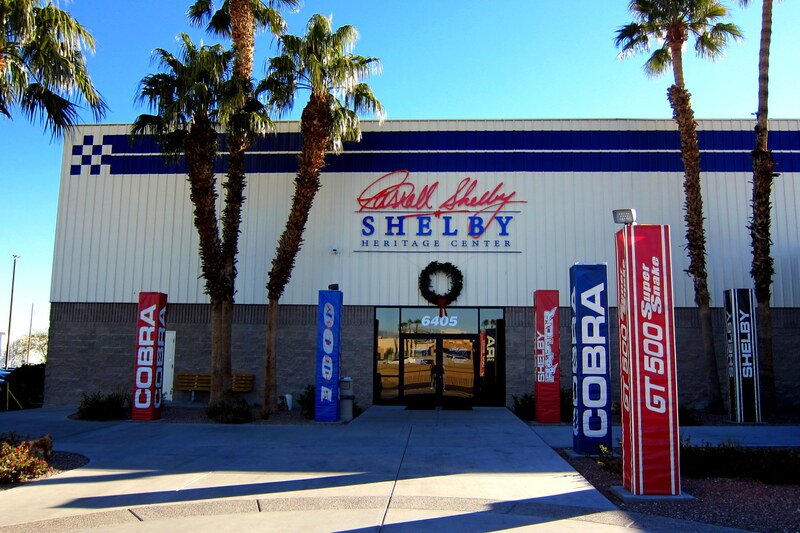 If you ever find yourself in Vegas, make it a point to visit the Shelby Heritage Center, it’s free and a very enjoyable experience for the auto enthusiast. During our stay, we received word that two friends from San Diego were in town for the holiday. Joanne and Ron were staying in a hotel on the strip so we gathered up the boys and headed downtown. 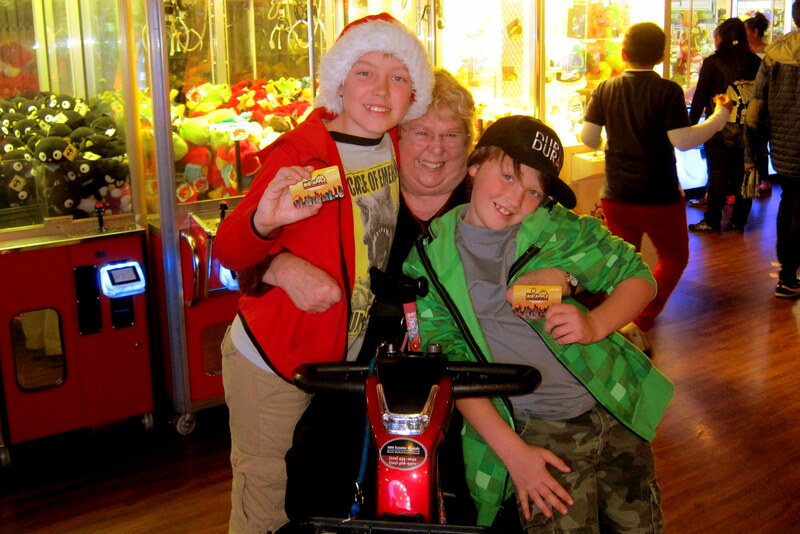 After visiting in the lobby for a while, we all went to the casinos video game parlor where Joanne treated Jack and Tucker to a series of plays on the various machines. They had a blast and ended up winning a number of additional plays! 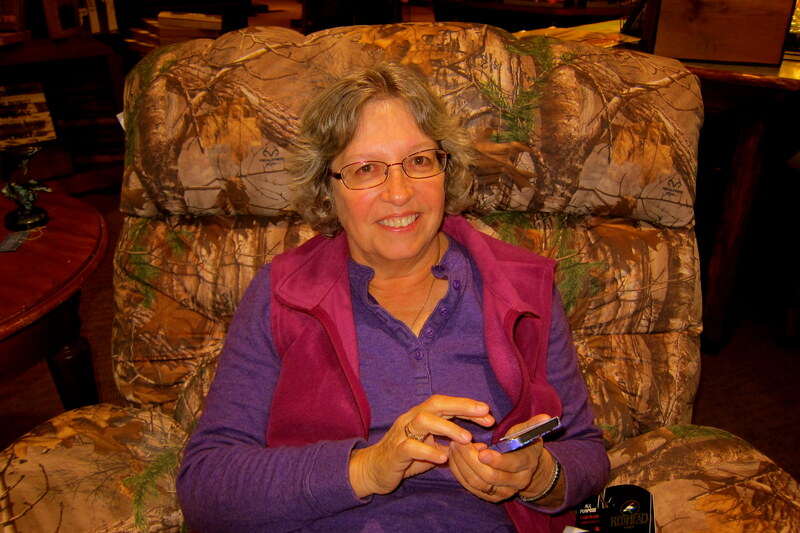 Joanne is a childhood friend of Kit and mine that we had lost track of for over fifty years. Fortunately due to some skillful sleuthing by Kit, we reconnected last year and are looking forward to spending even more time with them when we visit our old hometown next month. The main reason for our being in Vegas this time of the year is to spend Christmas with our two youngest grandchildren and their parents. 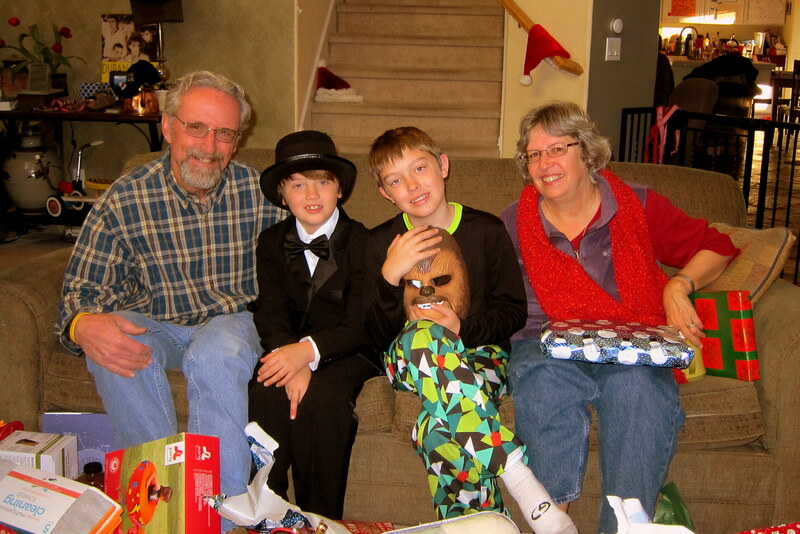 Kit and I were woken very early Christmas morning by a series of texts from the grands imploring us to get up, get dressed, and get over to their home…..Santa had visited! 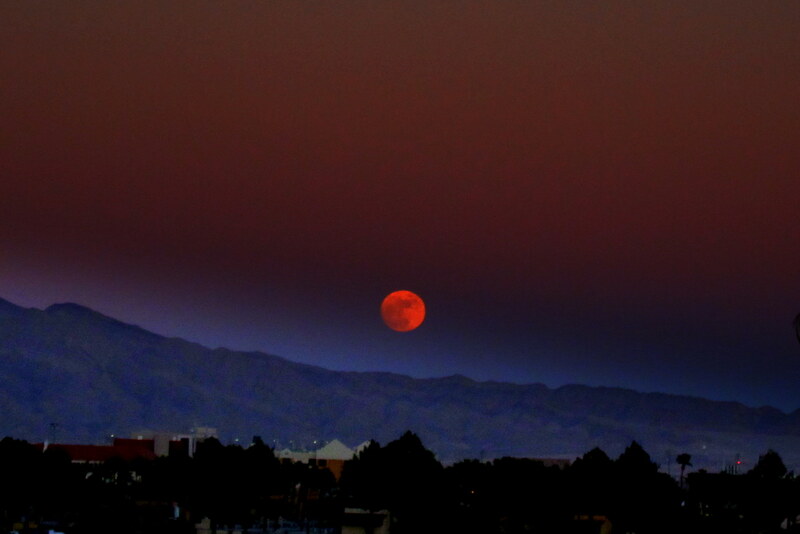 As we rolled out of the campground before daybreak, I spotted a full moon. Dubbed “The Christmas Moon”, this rather rare pairing of the holiest of days with a major celestial event hasn’t occurred in almost 40 years, and will not be repeated for many a moon (pun intended)! 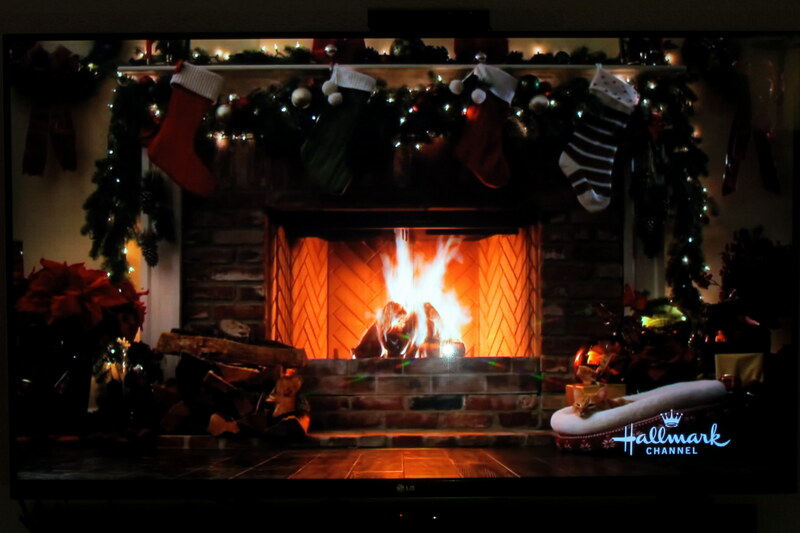 Even though it was colder today than at our home in Maine, we had a roaring digital fire on the large screen to help ward off the virtual chill in the air. The boys made quick work of opening all their presents and then took to playing with them for the remainder of the day, interrupted only by an excellent holiday meal. Kit and I thoroughly enjoyed sharing Christmas day with our Vegas family. 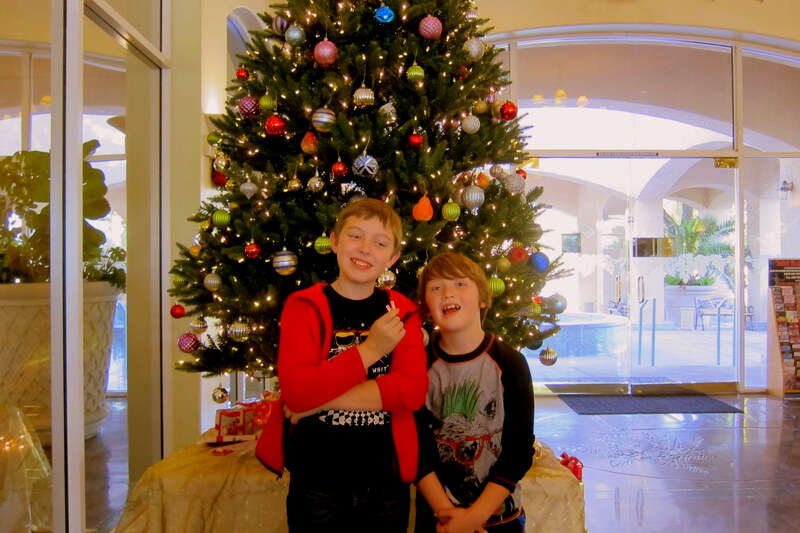 A large part of our two week stay was devoted to spending time with the family and especially Jack and Tucker. We took them on walks, to the bookstore, out to lunch, and also just watched them interact with each other and their friends during their daily activities…..it was a blast! A sad occurrence marred this otherwise joyous holiday period. 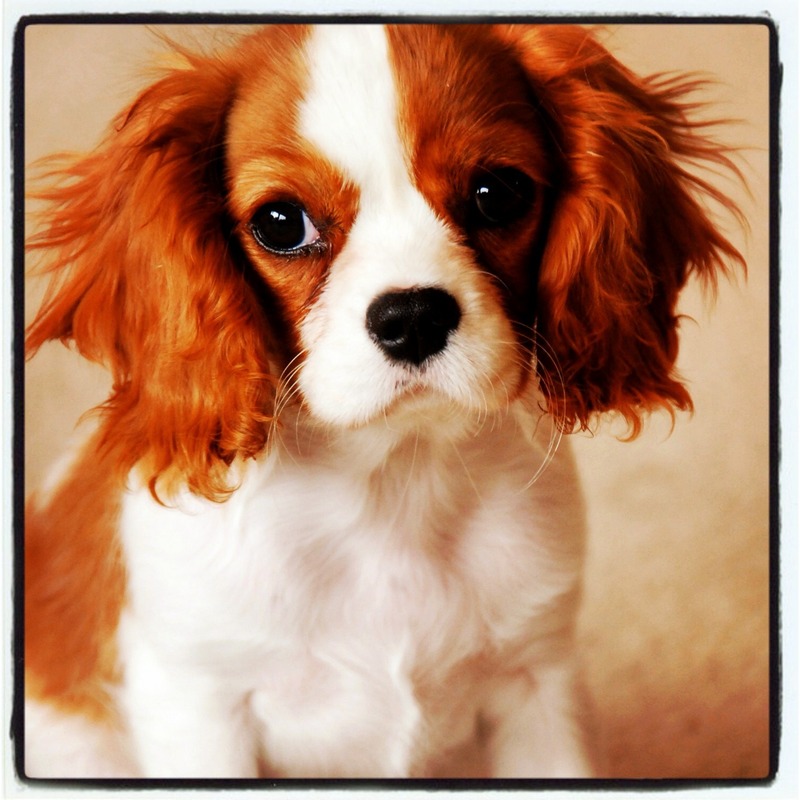 One of the families two Cavalier King Charles Spaniels took ill and later passed. Rosie was nine years old and was loved by his immediate family, friends and neighbors, as well as Kit and I…..RIP Rosie, you were a good dog and you will be missed. 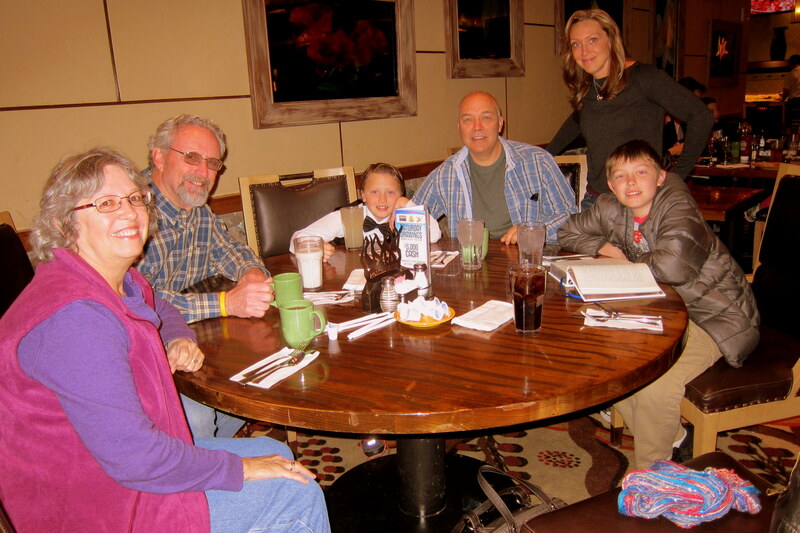 The day before the kids had to return to school, and Kit and I were scheduled to depart, we all met at the Silverton Casino for a fantastic Sunday brunch. Rated as one of the best on the strip, the menu was extensive, the service first rate and the food excellent! 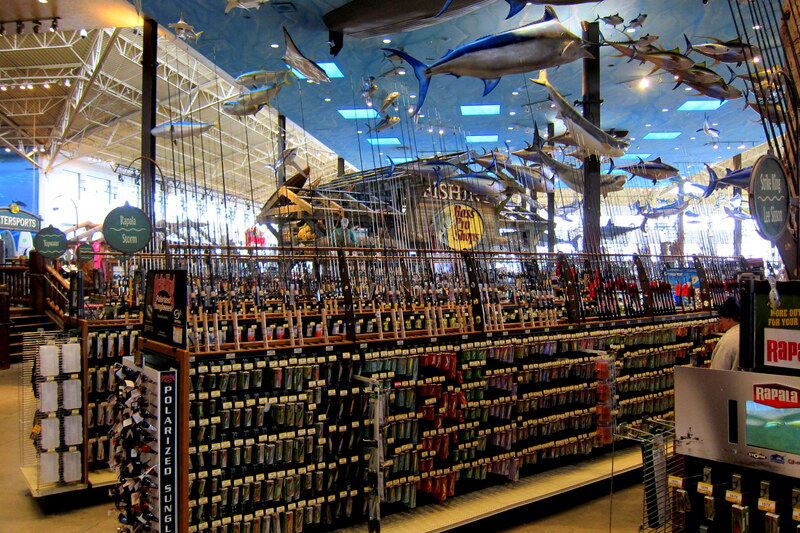 The Silverton is connected to a huge Bass Pro Shops store and an excellent source for rugged clothing and outdoor gear. While hunting for some shirts, I noticed a strange aquatic creature in the large fresh water aquarium that was a centerpiece of the store. 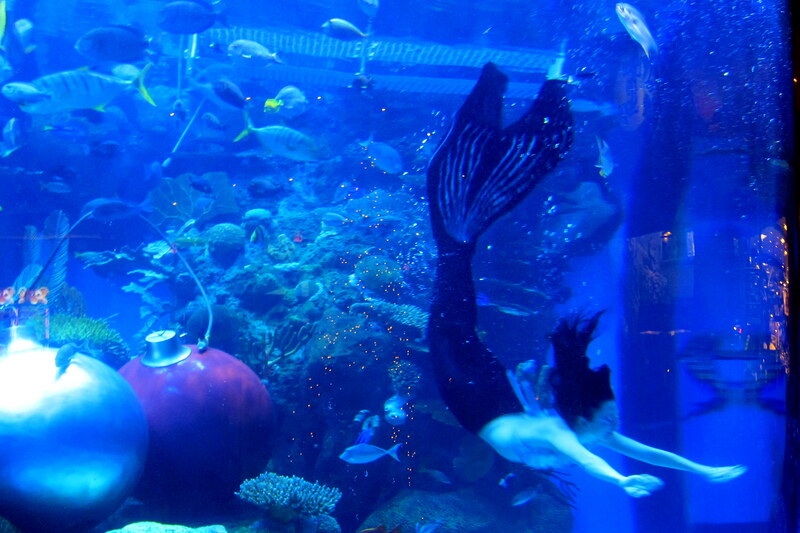 Wondering if mermaids were in season, I was dissuaded by a security person from grabbing one of the display fishing poles and trying my luck. Couldn’t locate Kit to tell her the tale of the fish that got away, then she texted me to turn around as I stood close by and I eventually picked her out amongst the woodland camouflaged recliner. Before closing out this episode of Bill and Kit’s 2016 Excellent Adventure, I would be remiss if I didn’t mention the rest of our family back home in Maine. 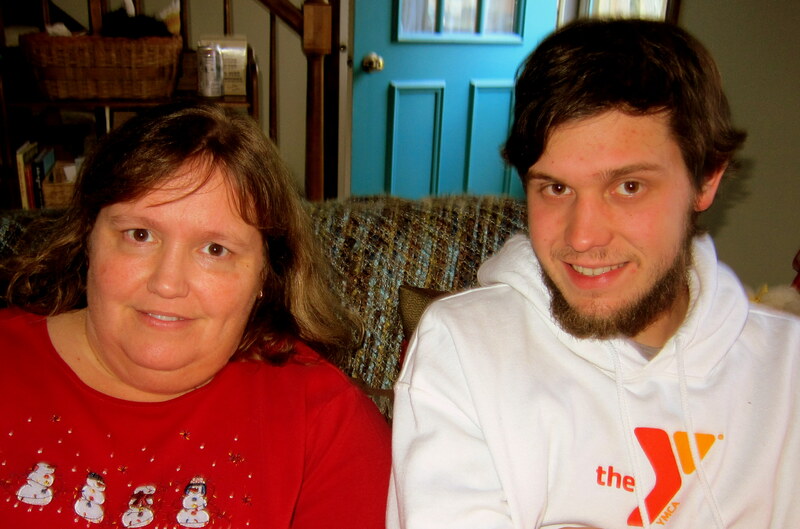 Our eldest daughter Kim, shown below with her son Joe, watches over the family home while Kit and I take off gallivanting about the country. Joe works as an apprentice sailmaker during the winter and a whitewater river guide over the summer months. 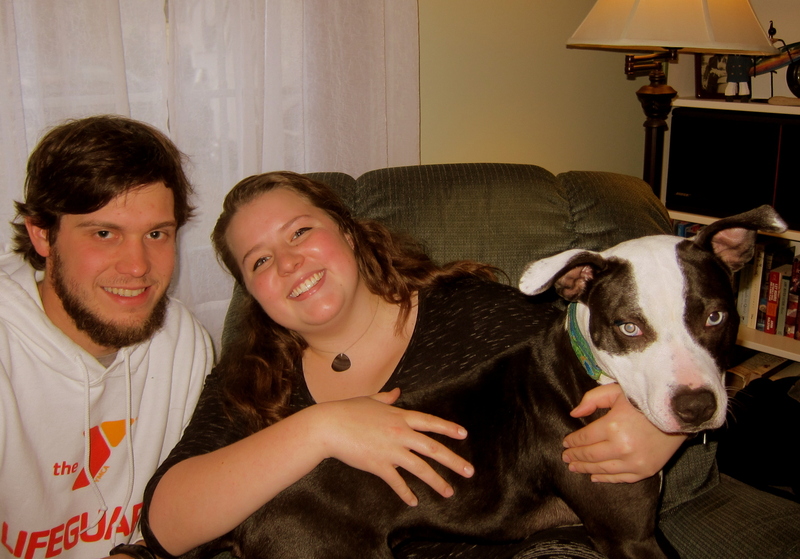 His sweet girlfriend Abby works for the local humane society…..she and their playful pup Mosey are welcome and frequent guests in our home. Joe and Abby have recently acquired an historic 185 year old farmhouse they are slowly bringing back to life with the goal of moving in soon. They are accomplishing much of the work themselves and are learning a great deal about old house restoration! 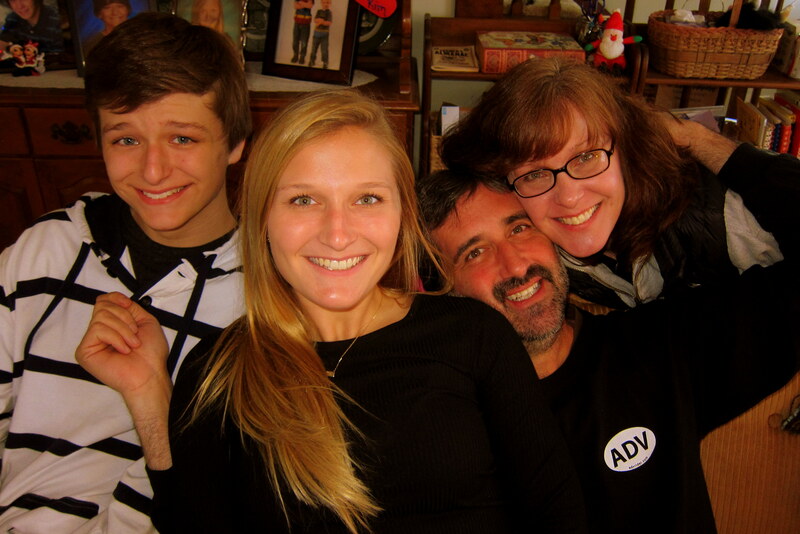 Our son Joe and his family, Ann, Katie and Chris live an hour away in a home that Joe mostly built himself on eighteen acres of wooded land. Katie attends college in New York where she plays Division One Lacrosse and Chris is a high school student-athlete in his own right. 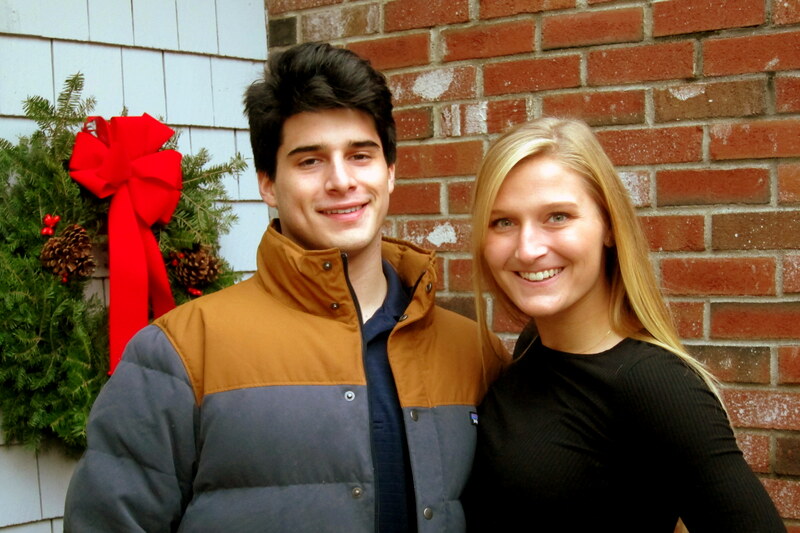 Katie’s longtime boyfriend Jimmy is on Sabbatical from college in New York and is currently in Prague, teaching English as a second language for the semester. He is a frequent guest at our home and, during the summer at the family camp. We were pleased to host all our Maine (no pun intended) family at our annual Thankmas celebration and were able to say our goodbyes before leaving on this adventure. As many of you know, I’m a hobbyist woodworker. 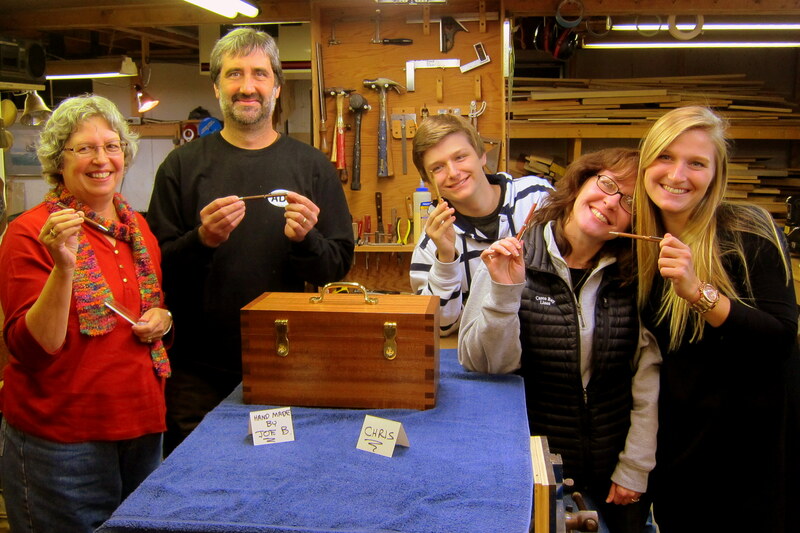 And for many years I have handmade Christmas gifts for our grandchildren until they “age out” at eighteen years old. Well, our grandson Joe has taken up the hobby and this year he turned some beautiful wood pens for members of the family. It is nice knowing that the family basement workshop will be productive during the long spells we are on the road! As the sun sets on our final day in Vegas, Kit and I are truly blessed that we have great kids; fantastic grandkids and wonderful friends. We hope everyone had a very Merry Christmas and enjoy a prosperous and healthy New Year! 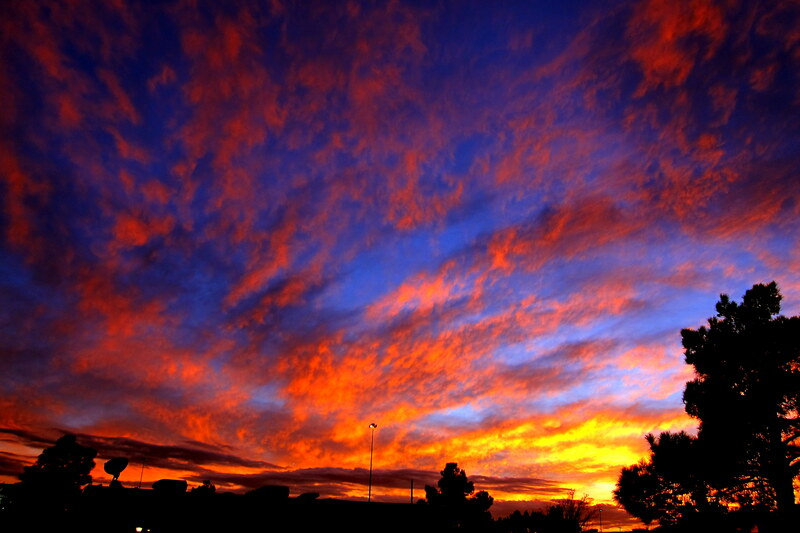 Tomorrow we once again hit the road, and the destination is sure to be both enjoyable and poignant……stay tuned! Kit’s Bit’s: We have been so fortunate to be able to spend the holiday break with our two youngest grandsons the last few years. Watching them grow and change is amazing! Jack has become so interested in school, and loves reading and video games. We took him to Barnes and Noble and I bought him a HUGE Star Wars book which he loves! Tucker, on the other hand, is much more active and can’t be bothered with sitting “still” for any length of time. He’s always up for anything active! For Christmas, he received a Tuxedo! He was thrilled! He now loves to wear it; or the vest and tie over a white shirt most of the time. He loves to make funny faces, especially for the camera! Just like his mom did when she was younger! We have very few pictures of Suzie as a child, with a straight face. We love watching both these kids as they grow and develop and exhibit some of the same traits as their parents and other family members. Terry has a Shelby, so I will mail this blog to him. Glad to hear you had such a great holiday season. Safe Travels! Thank you for sharing your special Christmas time with your family, with all of us! We too, take our grandkids shopping before we head south each winter….fun to have them try to remember their choices that were made in August! Everyone who reads your blog gets to travel along with you, and reminisce a bit about their own travels in the past. And suggests places we must check out on our next personal adventure in this amazing United States! Take care, and travel safe! I had my first comment right off…..I am NOT surprised at all why your journals are so popular. They are extremely interesting, informative, dream inspiring, funny, and beautifully well written and the pictures are just incredible. What’s not to like? I’m waiting for the book!! I look forward to each and every journal…..
Just caught up with your last three journals. We enjoy being with you in your adventure. 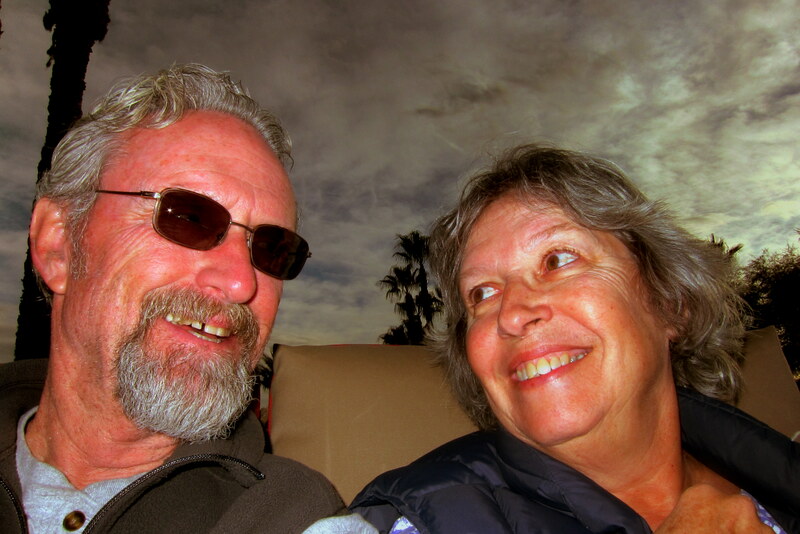 Our only adventure will be our Florida trip leaving Maine, weather permitting, on Feb 21. We will return to Maine around May 5. 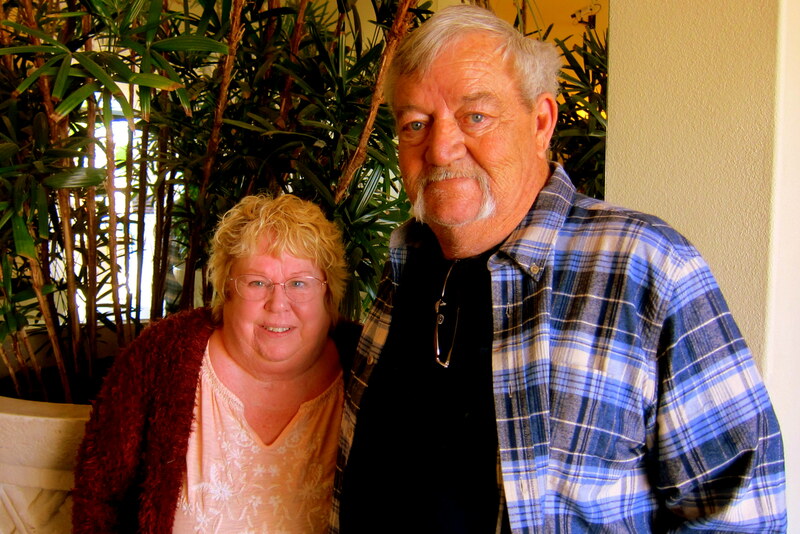 We are so thankful that Denise has recovered well enough to make this trip. Starting June 2, life for Denise has been very bad with little relief from pain in both legs and feet even after the 5 hour surgery Aug 14. The future looked quite bleak. But starting around October, she started to feel improvement. Pain diminished and finally went away as the nerves were healing. For the past month, she was walking again, short distances and with the help of a walker. And now she walks without the walker but she is not very stable on her feet. It will be months of additional therapy before she can maybe able to dance again. But thank God she has no more pain. Florida sun should help the healing. You adventure is good therapy for us. We relive our camping adventure through your daily adventures. The pictures are great and the verbiage excellent. We have friends here in Topsham that left last Sunday for a four month around the world trip. The will be doing a journal also. It should be interesting. I so enjoy your blog. You two have been having such a great time. Merry belated Christmas (loved the moon photo and grand kids!) and Happy 2016. I keep hoping we will have a great time hitting the road. It is very cold in Maine today. Bill is able to drive and hike daily with Rufus. We are feeling very blessed these days. Continue onward and keep us laughing. You certainly know how to enjoy life! One of the many things that make your journal so appealing to so many people is that you bother to research and include history and background about the places you visit. And for those of us who know you well we enjoy seeing family and friends and what they are doing as well as what you are eating!! It’s fun to be reacquainted through your adventures with places we have been in the past and to be teased and tempted to visit places new to us. There would be an empty place in our lives without your journal to keep us connected during the long months when we are all away from our Maine homes. Keep it up!! Pretty chilly in this neck of the woods. The bay has finally buttoned up and the Smelt fishing colonies are in operation after losing about five weeks income. Jeanne and I enjoyed a great prime rib dinner at Maxwell’s Friday night with Windy and Nan after seeing the movie “The revenant” pretty gory but, great acting by Leonardo DiCaprio. Looking back at some old family pictures in previous journals shows how all the kids have grown. Actually you and kit never seem to age. Stay safe and by the way, Happy New Year!! !